(Press Release) - Sep. 4, 2013 - 2-time 2013 Artists In Music Awards winner, Glitter Rose will be rocking out and Hard Rock Cafe will be rocking the bar with drink specials during Acoustic Happy Hour every Wednesday throughout the month of September. 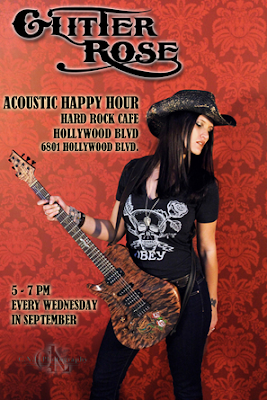 Check out www.hardrock.com/hollywoodblvd for details and make sure to mark calendars for Glitter Rose's last Happy Hour on September 25 for a special treat from Peter Grimm Hats, where Glitter will be hosting a special Peter Grimm hat giveaway at Acoustic Happy Hour at Hard Rock Cafe on Hollywood Blvd, so make sure to join us! The majority of Glitter Rose's famous hats are made by Peter Grimm, and have been for the past 10 years. Grimm now joins as one of the many proud endorsement companies that currently support Glitter Rose including TELEFUNKEN Elektroakustik, Orange Amplification,WARRIOR Guitar, Gibson Acoustic, BAE Audio, Fishman Acoustic Amplification, DiMarzio, Rotosound Music Strings, Guitar Hands Hand Care, Rebel Boards and Moody Leather. Glitter Rose is a 2-time winner in the 2013 Artists In Music Awards for Best Rock Artist and Album of the Year for Dead or Alive. She won Best Music Video for her video “Buda Negra” at the 2013 Bare Bones International Film Festival. Also in 2013, she was honored with the prestigious nomination for Texas State Artist – State Musician by the Texas Commission on the Arts and was chosen as one of the Top 3 Bands in Los Angeles, CA for Hard Rock Rising 2013 Global Battle of the Bands. GR's time is definitely here, receiving more nominations in the 23rd Annual Los Angeles Music Awards and the 2014 Artists in Music Awards. Her music is being recognized, awarded, and paving the way to stardom for this deserving and hard-working artist.